The VOID is a mixed reality experience that builds virtual worlds over physical environments, allowing users to experience enhanced Presence as they’re able to feel the actual objects around them and wield real props like lanterns and swords. 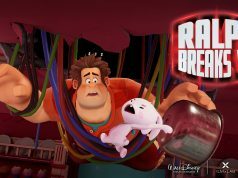 Road to VR’s Chris “DeepRifter” Madsen is one of the first to step deep within this promising VR theme ride of sorts. The quality of virtual reality is measured by Presence; a state of being in which the brain is convinced that what it is experiencing is real. When Present, we seem to process our virtual interactions as experiential events. As such, users often find themselves reacting to virtual environments as they might in real life both physically and emotionally. There are many strategies that can be implemented to stack the deck towards achieving Presence. Crossing this threshold is like throwing a switch; suddenly you are no longer an observer but a participant in what seems like a real space. 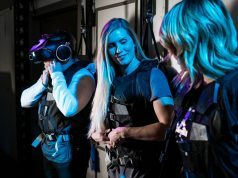 The VOID, a new virtual reality company based near Salt Lake City, Utah, is preparing to stack the deck for Presence in a big way. Based on the over nearly 2 million hits received on their launch video since last week, I would say the world is intrigued. 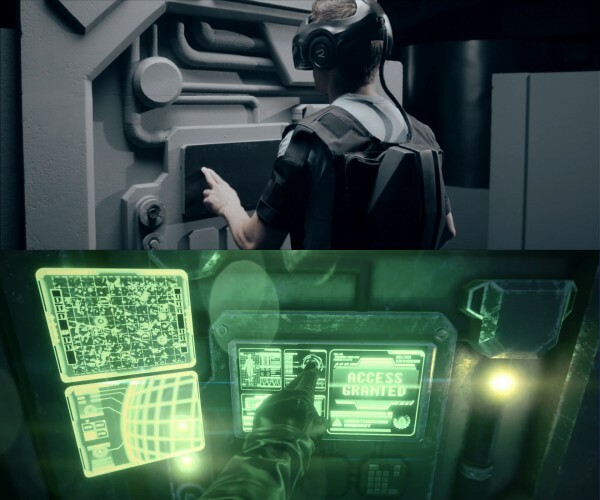 Seemingly taking notes from decades of virtual reality research, The VOID seeks to maximize Presence-inducing techniques in a variety of ways which include custom-made systems, like a VR headset, wireless positional tracking, body tracking, 3D binaural audio, haptics, physical props, and real world environmental effects. The VOID says their upcoming VR headset, ‘The Rapture’, will have custom features and specs higher than what Oculus, HTC/Valve, and Sony are preparing to unleash on consumers over the next year. 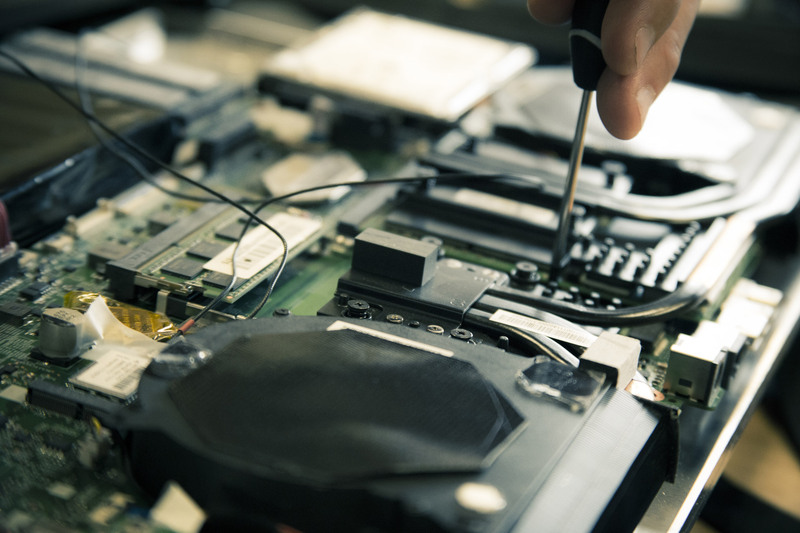 CEO, Ken Bretschneider, says they are not targeting the home consumer market, which allows them to build higher cost devices designed to take immersion to the next level. VOID hardware prototypes will be revealed soon according to Bretschneider, who is excited to teleport people’s bodies and consciousnesses into worlds we have, up until now, only dreamed of inhabiting. 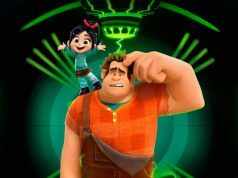 The VOID (Vision of Infinite Dimensions) will allow individuals, families, and friends to share in interactive experiences by merging the real with the virtual, the company says. James Jensen, Chief Technology Officer of The VOID, would be my guide for a hands-on demo of a ‘pod’ prototype, one of the company’s real/virtual environments. 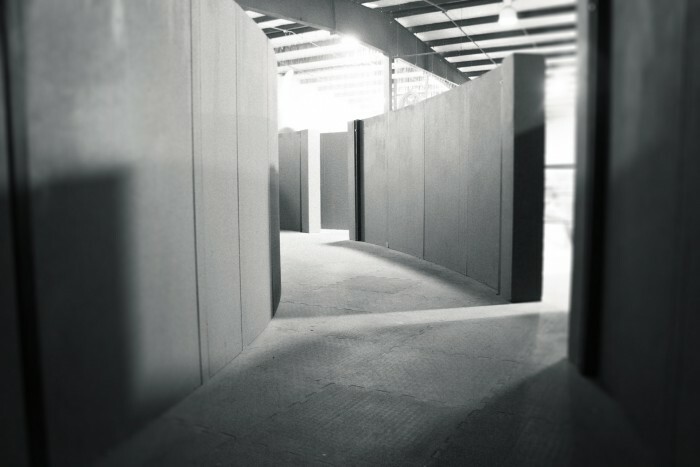 I was led to the staging lab (no cameras allowed) and saw what resembled a stage set; a collection of moveable walls creating a maze of corridors, various sized rooms, props, and environmental special effects devices. This was a 30×30 foot version of the pod which will grow to cover a 60×60 foot space joining many other pods when the company’s builds their commercial gaming space. The pod is designed to pair a physical construct with a virtual world that mirrors the two realities. If I see a railing in the virtual world, I am able to reach out and grab the physical representation of that same railing, which goes a long way to stacking the deck for Presence. The artists can then lay their imagination over the entire space as a fully rendered 360 degree 3D immersive experience. A look at The Void’s custom backpack computer. To enter into the virtual world I would need the appropriate equipment. I stepped into the outfitting room where Jensen handed me a backpack that contained a customized computer. I was quite surprised at how light the pack was due to the aluminum casing surrounding the hardware. Chest and waist straps kept the pack snug to my back to where I barely noticed it during my time inside The VOID. Jensen said that the case will be half the size for the consumer-ready experience. Next was the helmet, which contained speakers, an Oculus Rift DK2, and positional tracking equipment; all of which are placeholders until the company’s custom equipment is unveiled to the public. This experience would be wireless, with my position tracked by a couple dozen cameras mounted to the ceiling. I suited up and stood in the control room while my location within the space was calibrated. I turned around and saw that a shimmering door had appeared in the room. Leaning back and forth, I examined the surface of the portal which resembled rippling water. I took a breath and, like Alice stepping through the looking glass, I entered The VOID. It appeared I had landed in some sort of facility. With no tethers, I was able to step freely into the virtually rendered world surrounding me. Five steps in and my heart beat picked up as I experienced the freedom of wireless tracking, making it feel as though I was walking into a dream. At 10 steps I spun around and shook my head to see if I would break the illusion. There was no noticeable latency and the tracking, matching my physical space with the virtual, felt spot on. The sense of Presence built as I reached out to touch a stack of crates in front of me, the image becoming real as my hands were greeted with a real wooden surface. Intrigued by the merging of worlds, I dragged my hands across the surface, leaning my weight into it, and pulled myself up to peek over the ledge at the space beyond. The prop felt to be an exact match to what I was seeing through the lenses of the VR headset. In The Void, the physical environment can be thought of as the real geometry of the space, while an identical virtual environment adds texture. I noticed a bench a few yards away begging to be tested. I paused, flashing back to my own experiments with the Oculus Rift ‘Desk Configuration Utility’ in which I had once attempted to pull myself up from a sitting position using a virtual chair and promptly fell through to a very real floor below. I queried my guide with skepticism. “Trust it,” he said. That was what I was hoping to hear. I walked over and sat, effectively anchoring my brain to the virtual environment. What I didn’t understand at the time was that I had entered the lair of magician Curtis Hickman, Chief Creative Officer of The VOID. Hickman is a talented and respected magician with almost 2 decades of experience. He’s hobnobbed with the likes of David Blaine and the legendary Lance Burton and worked on an illusion with David Copperfield. 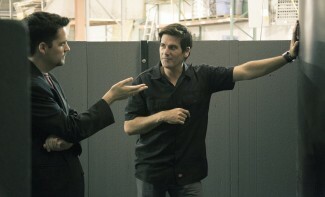 Criss Angel recently used a magical creation of his for the international television series “Mind Freak”. In addition, Hickman is an award winning visual effects and motion graphics artist. Curtis spoke with me about virtual experiences using a ‘pod’ and how imperative it was to “set the stage” for maximum effect utilizing elements from both the virtual and the real to create a new type of illusion which I am inclined to call ‘cyber magic’. Hickman is visibly passionate about the experiences he is directing and in using his knowledge of magic, stage production, and virtual reality to manipulate the minds of the participants. My first encounter with Hickman’s magic occurred as I exited the virtual room and found myself standing at the end of a long straight corridor. I walked the full length of the hall, soaking in the visuals as I passed under shafts of digital sunlight illuminating the dust particles suspended in air. Arriving at the end I was stopped by Jensen who lifted my headset and pointed back from where I had come. The hallway was not straight at all, though my brain had been convinced that it was. Looking back down the curved hallway I couldn’t see my starting point beyond the bend. I had just experienced redirected walking without knowing it. Redirected walking, a technique which employs subtle shifts in virtual direction, subconsciously redirecting users’ walking while leaving them convinced they are walking perfectly straight. This is possible due to the fact that our visual sense is dominate over our proprioceptive and vestibular senses. Taking advantage of this, a developer can literally have us walking in circles without our knowledge. Magic indeed. Suddenly it doesn’t matter how physically big the gaming pod is. Using this technique in conjunction with strategically designed props alleviates the concern of restrictive boundaries, effectively creating an unlimited explorable environment. How’s that for opening up exciting possibilities? Making my way around the facility, I had no idea where I was positioned in the real world. I walked through an open door and discovered the facility was attached to a cliff rising hundreds of feet above the surface of an alien planet. I stood on the walkway soaking in the scene beyond. A strong wind hit me as I moved forward making me feel slightly unbalanced as I approached the edge. I crouched inches from the drop, surveying the otherworldly horizon, my shirt flapping around me. VR doesn’t erase our memory. I knew full well I was in a simulation and that my guide would keep me safe from doing something really stupid; but knowing this didn’t seem to make much of a difference as I found myself pushing to test the illusion by stepping off the edge. The best I can describe the sensation is similar to how one feels when doing a trust fall in which one stands on a platform and falls backwards into the arms of the participants, hoping they will actually catch you. I finally mustered the courage, reached my foot out, and encountered… air! My confidence shattered onto the rocks below. The actual floor was about a foot lower than the platform. Jensen laughed and said that they have discovered that it really only takes about an inch high step to make people believers. Was that Hickman I heard snickering in the distance? The finale for this particular demo presented itself as an elevator ride to a second level high above. I stepped onto the lift and it came to life. Vibrations pulsed under my feet as the elevator began rising. My knees felt weak as there was no railings to hold onto. It was so easy to fall into the illusion as the platform I had been walking was left below. I had reached the upper level but in real life had gone absolutely nowhere. Jensen chuckled about how people will yell down to him from the ledge high above, not realizing they are only an arm’s length away. Returning reluctantly to the ready room, I removed the gear and adjusted back to reality. As an experienced explorer of virtual reality and a Rift DK2 owner myself, it was exciting to experience first-hand how wireless tracking combined with the pod environments contributed to achieving and maintaining long moments of presence. It was a wonderful time. 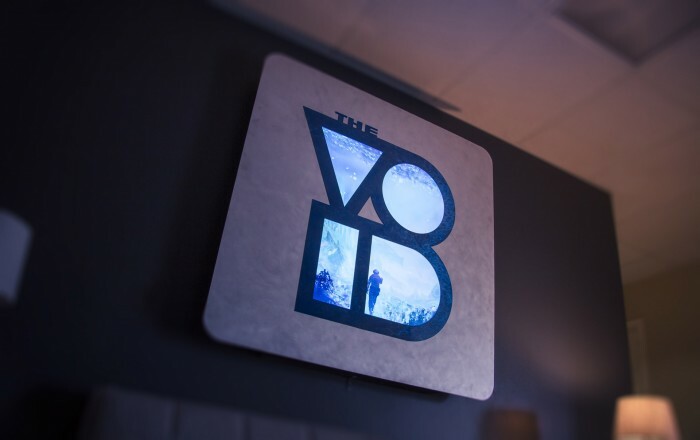 With millions of dollars invested in assuring theme park quality environments, the procurement of talented artists who understand the magic of VR, and promises of customized high end immersive equipment, The VOID is poised to become a defining entity in the virtual entertainment arena. The computer-in-a-backpack idea would be perfect for any Vive games that we are supposed to play standing up. One of the smaller Steam machines should have a battery-powered backpack that it can slide into for such games. I think a computer-in-a-headset form-factor will be coming before too long. They will be as powerful as what we currently would expect from a backpack computer. It is then that environment-scale VR/AR will really take off. is the graphic of the videos actual ingame footage? can they provide this graphic?